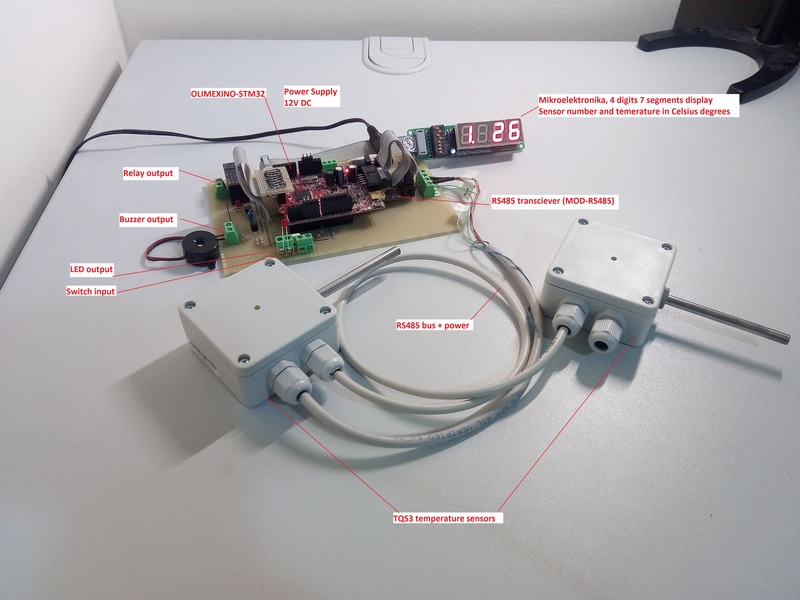 Small project showing how to read temperature from Papouch TQS3 thermometer and display temperature on a 4 digits 7 segment display from Mikroelectronica (MIKROE-201: Serial 7-seg Display Board MAX7219). Above operations are controlled by a STM32F103 microcontroller, on a OLIMEXINO STM32 board. All things are connected together using a prototyping board - Base board in System diagram. 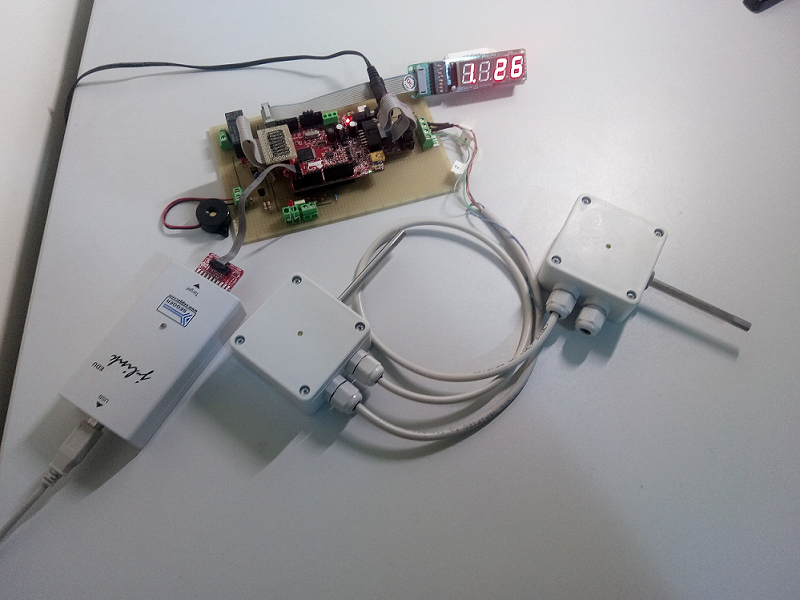 UART 1 is connected to RS485 transceiver, communication bus for temperature sensors. Open image in new tab to enlarge Diagram was drawn using Draw.io online diagram software. File is saved in diagrams folder (system_diagram.xml file). STM32CubeMX application was used to generate C initialization code (see olimexino_stm32.ioc file). Link to this tool is at the end of the ST page - GET SOFTWARE section. Project root folder contains below folders. Most of them are explained below. Folders Inc and Src contains C files generated using CubeMX. CubeMX project was saved in olimexino_stm32.ioc file. Below is a screen shoot of CubeMX project. What is green is used in this project. Initialization code need to be regenerated only when pins and/or microcontroller peripherals has changed. Visual Studio project should look as below. To successfully open the project VisualGDB should be installed, GCC toolchain should be present and Embedded BSP for STM32 should be downloaded. VisualGDB will ask to download the toolchain and necessary Embedded BSP if you try to open the project (temperature_monitor.sln) and above are missing. Visual GDB use systems Users folder for shared files (Embedded BSP). This location will be different from what is now in project. To update for new location use Regenerate MCU files button from VisualGDB Project Properties - see below picture. Schematic for the base board (this board is used to route signals from/to other boards and adds I/Os) is in "hardware" directory. A screen-shoot is below. The software is licensed under MIT License (this license apply to modules contained in "sources" directory. Generated files has a license similar with this license - see generated files license section).